MnDOT installed network dash cameras and ceiling-mounted cameras on 226 snowplows, approximately one-quarter of MnDOT’s snowplow fleet. The cameras, integrated with the onboard mobile data computer and automated vehicle location equipment, automatically captured snapshots of road conditions during plowing. The snapshots were incorporated into several facets of MnDOT’s 511 traveler information system: the desktop and mobile versions of the website and the 511 app. 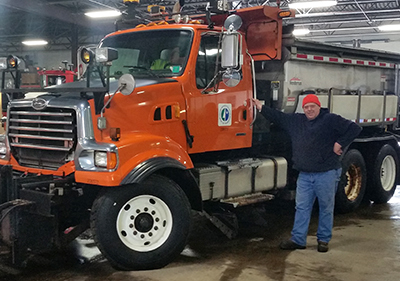 Motorists and MnDOT alike found the project to be valuable, with the up-to-the-minute imagery helping members of the public and MnDOT’s maintenance staff make well-informed decisions during winter storm events. “The largest barrier to implementation involved the development of the software package for integrating snowplow cameras into the current AVL system. It required a great deal of back-and-forth to get things right,” said oe Huneke, Maintenance Decision Support Systems (MDSS)/AVL Section Manager, MnDOT Office of Maintenance. “We did research to make sure the cameras did not block drivers’ views, taking state and federal regulations into consideration, and we tested the cameras to make sure they were capturing images at the right resolution,” said Jon Bjorkquist, Maintenance Technology Development/ Implementation Coordinator, MnDOT Office of Maintenance. Reliable information about road conditions during winter weather allows motorists to make informed travel decisions and helps MnDOT responders maintain roads. While meteorological updates on a winter storm and automated status reports on Minnesota’s snowplow fleet are important sources of data, they do not provide visual information about road conditions. In 2015, a pilot project allowed MnDOT to take road condition pictures from cameras mounted on selected snowplows during winter storms. The system was limited, however. Few snowplows were outfitted with these cam-eras, images were not available to the public, and network infrastructure did not allow for easy scaling. A larger scale program was needed to capture road imagery taken from snowplows across Minnesota and to share the pictures with Minnesota motorists. MnDOT sought to install cameras on a sizable portion of MnDOT’s snowplow fleet. In addition to making hardware and network enhancements to collect and compile the image data, MnDOT also set out to make the photos avail-able in near-real-time to its internal maintenance staff and the traveling public. To capture images of road conditions, MnDOT mounted cameras in the cabs of one-quarter of MnDOT’s snowplow fleet. The dash cameras automatically recorded images whenever the computer-AVL system was on. The cameras recorded an image of the road ahead of the plow. Images were taken once every five minutes and were only retained if the plow was moving at least 10 mph. The cameras were capable of taking operator-initiated snapshots and video clips. Video clips could be classified into three categories: accident, general interest or work zone. The system sent the plow camera images and metadata (geolocation, plow, camera and conditions) to a MnDOT server upgraded to accommodate the data. MnDOT set a data retention schedule for mobile snapshots and video segments as well as the data server. Plow images were incorporated into several facets of MnDOT’s 511 traveler information system, including the desktop and mobile versions of the website and the 511 app. Plow images plotted at 10-minute intervals on the 511 maps provided motorists with up-to-the-minute, easily accessible information on road conditions. The images were also incorporated into MnDOT’s internal website called Condition Acquisition and Reporting System. The project demonstrated the successful integration of various hardware, software and network systems, carrying the road weather imagery step by step from the cameras to the public 511 interface. The project also succeeded in scaling up an earlier, modest effort to furnish snowplows with cameras. In addition, MnDOT collected input on the value of the cameras from a range of interested parties: the public, snowplow operators and supervisors, and MnDOT management staff. The public response was overwhelmingly positive, with 319 Facebook users responding to a MnDOT post about the cameras. All the respondents used positive emote icons (“heart” or “thumbs up”). Several members of the public provided responses through Facebook and MnDOT’s “Contact Us” Web page about the value of being able to view actual road conditions, though others expressed concern about the cost of the system. Perform outreach efforts that clearly communicate benefits to achieve broad buy-in from snowplow drivers. Provide training and follow-up instruction on use of the cam-era’s features to encourage drivers to use the manual snapshot and video features. Address drivers’ concerns about privacy (such as “Big Brother is watching”) directly, and understand that these concerns have lessened over time. Supervisors should be advised not to react too quickly to privacy concerns. Address concerns about in-cab distraction by adjusting the system configuration or hardware. This might include making dash camera screens dimmable at the driver’s option, or placing screens and cameras out of critical sightlines. This project was a success, with snowplow camera images providing significant benefits to MnDOT staff and the traveling public. Based on this work, MnDOT plans to install camera systems on additional snowplows in the state fleet—as deemed necessary by district management—and to continue displaying snowplow images on MnDOT’s 511 system. This post pertains to Report 2017-41, “Installing Snowplow Cameras and Integrating Images into MnDOT’s Traveler Information System,” published October 2017. Living snow fences are trees, shrubs, native grasses, wildflowers, or rows of corn crops located along roads or around communities and farmsteads. These living barriers trap snow as it blows across fields, piling it up before it reaches a road, waterway, farmstead or community. Through multiple research efforts, MnDOT continues to advance its practices for living snow fences. Willow plants, which are which are inexpensive and fast-growing, are a new form of snow fence. MnDOT has also developed a tool that allows the agency to better offer a competitive payment to farmers. According to recent studies, researchers believe Minnesota could eliminate salt usage on low-volume local roads by switching to permeable pavements. Permeable pavements — pavements that allow water to seep through them — have been studied in some Minnesota cities, and a research project is currently underway to further investigate how much salt reduction can be expected. MnDOT’s Metro District developed a way to automatically determine when to stop plowing a highway after a snow storm. The method involves measuring traffic flow to determine when road conditions have recovered. Current practice calls for maintenance workers to visually inspect traffic lanes. The automated technique could potentially be more accurate and save time and costs. Minnesota winters are no joke, and Minnesotans still need to get wherever they’re going despite harsh snow and ice conditions. That’s why MnDOT is constantly researching new and improved versions of salt and other deicing chemicals to keep roads safe at the least amount of damage to lakes, rivers and groundwater. A couple years ago, MnDOT snowplow operators in southwestern Minnesota invented an experimental plow that uses the wind to cast snow from the road without impeding traffic or the operator’s view. This winter, MnDOT intends to test multiple types of snowplow blades as part of a larger research project comparing types of deicers. While a lot of research has been done on the plow itself, MnDOT hasn’t forgotten to invest in research to improve in-cabin snowplow technology as well. Some of the great technology recently developed to assist snowplow drivers, includes a driver assist application that a MnDOT plow driver used last winter to navigate a storm and rescue stranded motorists. The agency is also studying equipment factors that can cause fatigue in snowplow operators. When the snow melts every spring, the damage salt does to roadside grass is obvious. That’s why researchers have spent years looking into developing and implementing salt-tolerant grasses on roadside settings. The result of this effort has been the introduction and use of salt-tolerant sod and seed mixtures that are made up primarily of fine fescue species. MnDOT is also studying how chlorides are transported within watersheds in order to better focus efforts to reduce deicer usage in areas where it will have the biggest environmental impact. MnDOT has developed a test that can tell whether a contractor’s proposed asphalt mix will cause the road to crack in the winter. Building roads using better asphalt mixes leads to less cracking and fewer potholes. The test is expected to save the state about $2 million per year. It’s not all about cars and trucks. Minnesotans still ride bikes and walk in the winter. That why MnDOT assembled a comprehensive review of existing practices and policies from other states, as well as a summary of valuable publications that could be referenced while developing a new policy. MnDOT research led to the development of a Maintenance Decision Support System and related components provide real-time, route-specific information to snow plow drivers, as well as recommended salt application levels. These recommendations have reduced chemical usage while still achieving performance targets for snow and ice clearance. Southwest Minnesota has the highest average wind speeds in the state—bad news for MnDOT snowplow operators who often drive in low visibility to clear roads. That’s why District 7 is piloting a snowplow driver-assist system (DAS) developed by University of Minnesota researchers to combat the blowing snow and fog that often cause zero visibility. The DAS helps snowplow operators see the road alignment and features, such as turn lanes, guardrails, and road markings. Even in less extreme winter weather, snowplow operators gain assurance of their lane location using the system. The DAS was developed and refined over the past 20 years under multiple research projects funded by MnDOT and the USDOT’s University Transportation Center program. Professor Max Donath, director of the University of Minnesota’s Roadway Safety Institute, led the work. In addition to plows, the DAS technology has also been applied in other specialty vehicles such as patrol cars and ambulances. Numerous vehicles using the system have been deployed in both Minnesota and Alaska. The DAS uses GPS technology and a front-mounted radar to provide an image of the road and any obstacles in front of the operator. 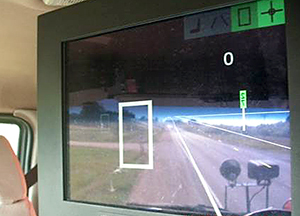 The image is displayed on a monitor inside the cab of the plow. The system also vibrates the operator’s seat as a warning if the plow veers too close to the roadway’s centerline or fog line. “If the driver gets within one foot of the fog line on the right side, the right side of the seat vibrates. If the driver gets too close to the centerline on the left side, the left side vibrates,” said Fester. The vibrations continue until the driver moves back into the center of the lane. The driver can also turn off the warning feature to clear snow from the shoulder. The DAS is currently installed in one truck in District 7. The $75,000 cost makes it difficult to install in every truck in the district or the state, although having at least one system in every district may be possible, Fester said. Fester said the system proved its worth one day in February when blizzard conditions caused zero visibility and forced many road closures in southwest Minnesota. He was called out at 2 a.m. Feb. 8 to assist a stranded state trooper and several motorists on a 12-mile stretch of Hwy 60 between Windom and Heron Lake. Fester drove a pickup behind the DAS-equipped snowplow, driven by Darryl Oeltjenbruns, to reach them. As the DAS identified stranded vehicles on the way to Heron Lake, Fester and Oeltjenbruns checked to make sure they weren’t occupied with people. Once they made it to Heron Lake, they stopped at the community center, where the state trooper and the stranded motorists he brought in were located. On the way back to Windom, Fester and the state patrolman continued to check on stranded vehicles as the DAS-equipped snowplow led the way. If the vehicles weren’t in the ditch, motorists drove behind the two MnDOT vehicles. If their vehicles were in the ditch, motorists rode in a Suburban that was also being escorted to Windom. After returning to Windom, the motorists were dropped off at motels or truck stops. Later that morning the DAS system was used again to locate other motorists. The benefits of living snow fences and other snow control tools to keep roadways clear of blowing and drifting snow have been known for decades, and MnDOT has been using a variety of these techniques for years to catch snow before it gets to a road. Living snow fences often consist of trees, grasses and even corn stalks left standing in a farmer’s field. Now willow shrubs are being added to the list as a fast-growing, inexpensive snow control measure. Fish Creek willow shrubs (left) grow alongside corn in September 2015. Researchers recently completed a study that investigated whether willow shrubs could make good living snow fences. While typical snow-fence plants, such as dogwood or cranberry shrubs, can take five to 20 years to establish themselves, shrub willows were effective at trapping snow after just two growing seasons, according to the study. In spring 2013, researchers installed three varieties of shrub willow side-by-side in two-row and four-row configurations along about a quarter of a mile of Highway 14 in Waseca, where snow drifts are an issue. In April 2014, they cut the shrubs down to the ground to encourage branching and bush density. Though the trimmed willows had little impact on drifting snow the first winter, each willow-shrub plot was collecting two to three metric tons of snow by the second winter, according to the research report. Researchers believe that after three or four growing seasons the willow shrubs could catch the entire mean annual snowfall on the site. In the four-row configuration recommended by researchers, costs of raising, furnishing, planting and mulching came to about $3.60 per plant, which is dramatically less than the contract bid cost for traditional living snow fence species that cost more than $50 per plant. In addition, the willow shrubs could be harvested and sold as biomass every few years to provide an income source. Willow trees is just the latest advancement in the state’s snow control program. A 2012 research project evaluated the costs and benefits of living snow fences and provided MnDOT with a payment calculator to determine how much to compensate landowners for installation and maintenance costs. A recent research implementation project created a mobile-friendly Web version of the payment calculator tool. The website also contains a tool for designing a own snow fence. MnDOT has used these tools and other promotional efforts to nearly double the number of farmers with contracts for corn rows enrolled in the Living Snow Fences program. The willow species recommended by researchers will be evaluated further in 2017 when they install it as a living snow fence on a new construction site on Highway 60 between Windom and Mountain Lake. Researchers also recommend a future study to compare volume of road salt use before and after installation. They also want to look into identifying appropriate buffer distances to keep willow roots from interfering with cropland root systems.